I’m back with another fabulous non-eggy 3 ingredient banana pancake recipe! In case you don’t already know, I’m borderline obsessed with healthy banana pancakes. It all started with these four ingredient healthy banana pancakes, which quickly gave way to these healthy peanut butter pancakes before finally ending in these healthy 3 ingredient banana pancakes. Just don’t take me literally when I say “…finally ending in…” because there’s an extremely unlikely chance these will actually be the last healthy banana pancakes I make. But when they taste this good, who cares how many different kinds I make? These healthy 3 ingredient banana pancakes are honestly so quick and easy to make, you could even have them for breakfast on a weekday morning. A Monday morning, even! 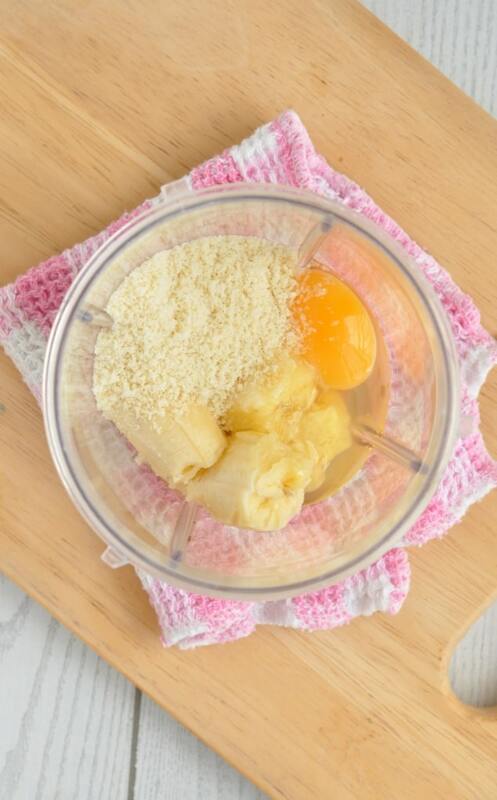 Simply grab your ingredients, toss them into your NutriBullet, blend, then cook up the batter. I swear these pancakes come together even faster than toast. You could make these healthy pancakes in any other type of powerful high-speed blender, but I’m 100% loyal to my NutriBullet. It thoroughly blends the batter up in literally seconds so it’s completely smooth without any lumps and it’s just so easy to clean. You can’t exactly toss a blender into the dishwasher when you’re done with it, can you? If you love making stuff from scratch and don’t have any almond flour, you can make your own. At the same time as you’re making the pancake batter! All you need to do is add 2 tablespoons of almonds into the NutriBullet with the banana and egg. The blades and motor are so powerful they will grind up the almonds and turn them into almond flour while mixing them into the batter. Because in case you didn’t know, that’s all almond flour is – ground up almonds. If you’re not a fan of making stuff from scratch and don’t have any almonds or almond flour, you can pick up a bag of almond flour from Amazon. Simples. Not really a big fan of nuts? 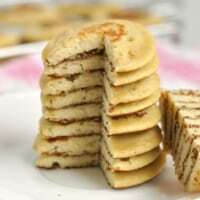 Then you’ll love this bit – these healthy 3 ingredient banana pancakes taste nothing like almonds! The peanut butter version of this recipe made with PB2 powdered peanut butter definitely tastes like peanut butter. But these ones taste absolutely nothing like almonds. I guess because almonds have got a really subtle flavour and the sweetness of the banana totally overpowers it. Whatever. They’re delish. 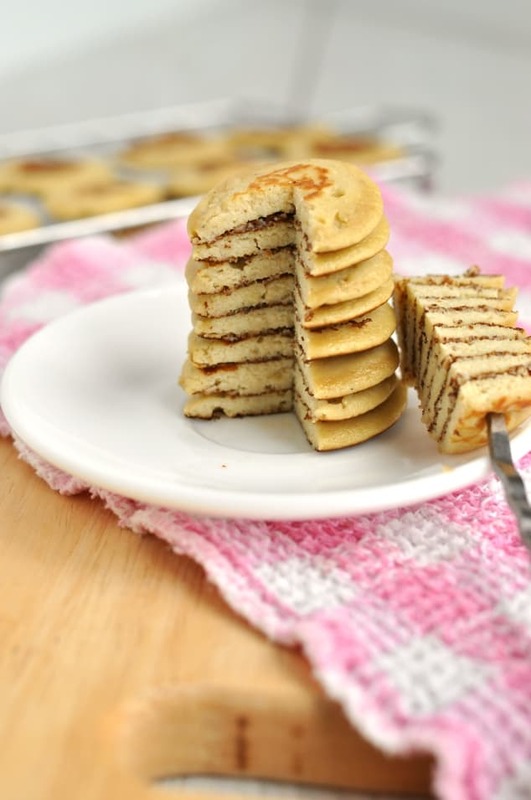 Bite-sized pieces of pure breakfast heaven, these healthy 3 ingredient banana pancakes will change your mornings forever! 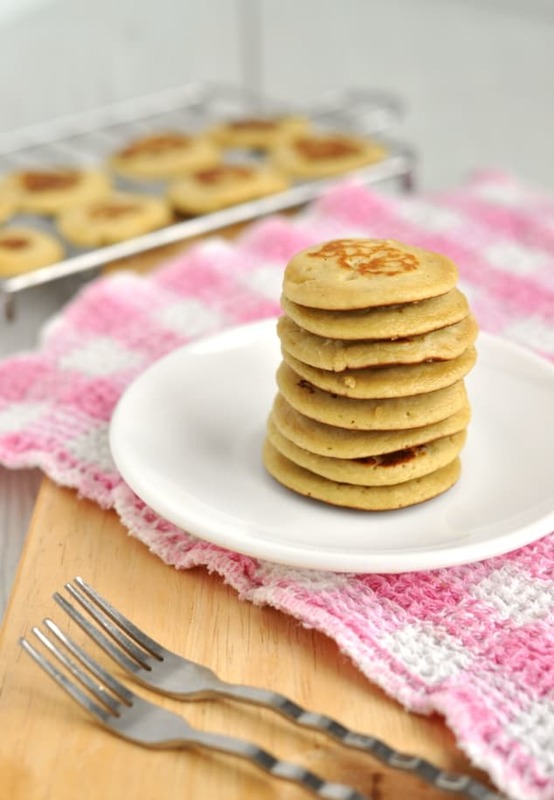 Made with just bananas, eggs and almond flour, these healthy pancakes taste incredible and are so simple to make you won't believe it. Place a non-stick frying pan/skillet over a medium heat and wait for it to warm up. While you're waiting, add all the ingredients into a NutriBullet or other high-speed blender and process until you've got a completely smooth batter. 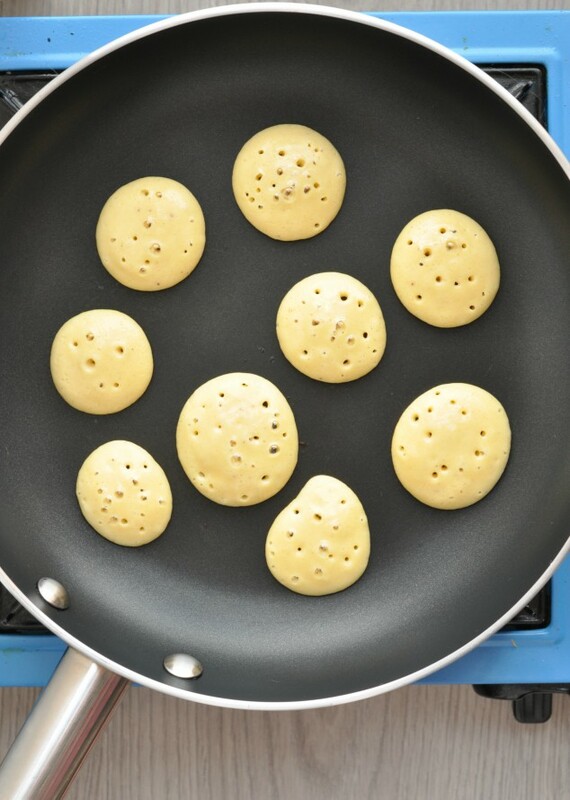 Pour 1 tablespoon of batter per pancake into the hot frying pan for mini pancakes or 2 tablespoons of batter per pancake for small pancakes. Cook for 30-40 seconds until bubbles appear on the surface then flip over and cook for another 30-40 seconds until lightly brown. Repeat until you've used up all the batter. Enjoy immediately while hot or keep warm in a 100F/50C oven until you're ready to eat. These pancakes store really well. Place them inside an air-tight containeran air-tight container and keep them in the fridge for up to 5 days or in the freezer for up to 6 months. Reheat in the microwave or in a frying pan over a medium heat.